Akwete cloth is a hand-woven textile produced in Igboland and named for the town of Akwete in Abia state, southeastern Nigeria. Made using palm, cotton and hemp, the colorful Akwete cloth is a major part of the region’s economy, partly because it attracts tourists who are eager to buy it and see how it’s made. The history of Akwete cloth is shrouded in mystery. Depending on who you talk to, it may be Portuguese inspired, or it may have been created by a woman named Dada Nwakata. Or both. According to another source — Akweteusa — Nwakata allegedly unraveled threads of a cloth brought to her region by the Portuguese between the 14th and 16th centuries, studied the weave structures, and copied them, adapting them and creating new designs. She is generally credited as being the first to weave with cotton in the Akwete cloth-making process. Nwakata inspired some local legends as well: She allegedly put a spell on her weaving loom so that nobody could steal her elaborate and stunning designs. Only after Nwakata died did her close friend — the only person she allowed in the room while she wove—reveal Nwakata’s weave structures. Ahia, a rather complex design that is controlled by the number of heddles (a cord or wire that the thread passes through). Ogbanaonweya, an intricate pattern used most by the Akwete community itself. 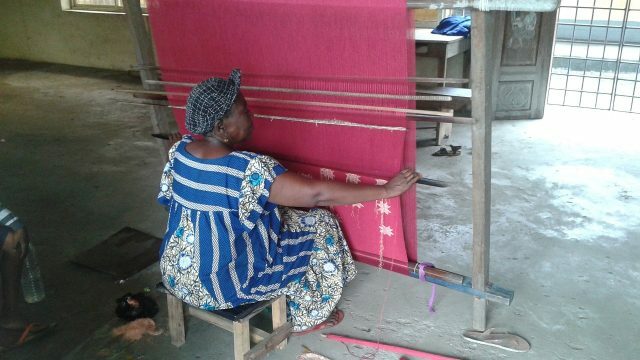 There are two types of loom — horizontal for men and vertical for women — but traditionally, women handled the Akwete cloth-making. In the early days of cloth weaving, the men of Igboland fished and the women made the cloth from local materials. For the most part, that’s still the the way it’s done today. Women who make Akwete cloth usually start doing so at a very young age. The Akwete community considers cloth weaving to be a gift you’re born with. Young girls begin weaving cloth as soon as their arms are long enough to work the loom, and make sections that range from 15-to-30 inches wide. As their arms grow and strengthen, they weave cloths up to 50 inches wide. Each cloth can take weeks to weave. Regions near and far from Akwete also make the cloth, and call it Akwete cloth, but the Akwete community is arguably the best at it. Akwete cloth is are worn in pairs in what’s known as an “up-and-down” fashion — one cloth is wrapped around the waist and another under the arms. However, Akwete women sometimes use just one very wide cloth to form a dress. Akwete cloth is also traditionally used in masquerades or other major events such as weddings, chieftaincy ceremonies and burials. The particularly coarse material holds onto elaborate decorations and dyes well. However, softer, more comfortable version made mostly of cotton are worn casually in everyday situations. Akwete cloth became popular when Abia State became a center of palm oil and kernel trade. The people of Igboland began trading Akwete cloth for all sorts of products with people of other regions and ethnicities, and the cloth’s fame spread. Eventually the creative designs and vibrant colors made Akwete one of the most famous textiles in Nigeria. 1963 was considered a landmark year for Akwete cloth. An exhibition dedicated to Akwete cloth was held at the Textile Museum in Washington, D.C. It also appeared in the Textile Museum of Canada and in the British Museum in the UK. Rufus Nna James, an Akwete chief, fought to get international attention for the cloth, which proved lucrative for the community. This international exposure created awareness of the beauty of Akwete products. Modern-day Akwete cloth designers adapt to customer demand. Today you’ll see four the traditional patterns as well as cloth depicting domestic animals, tortoises (considered the symbol of cunning and wisdom), ritual objects, the Nigerian coat of arms, the Nigerian flag, and even the logo of the All Black Festival of the Arts. A version of this article originally appeared in AFKInsider.com. Julia Austin is a professional writer living in Los Angeles who has written thousands of articles for dozens of publications on the topics of luxury living on a budget, travel, cooking, healthy living and relationships. She is a travel and healthy living enthusiast who has lived in Sweden, Switzerland, France and New York, gathering tips and tricks on a healthy lifestyle everywhere she goes. She is a thrift store and dollar store mega-fan who loves finding ways to live a fabulous life, frugally. She adores her dog, the outdoors and constantly learning new things!